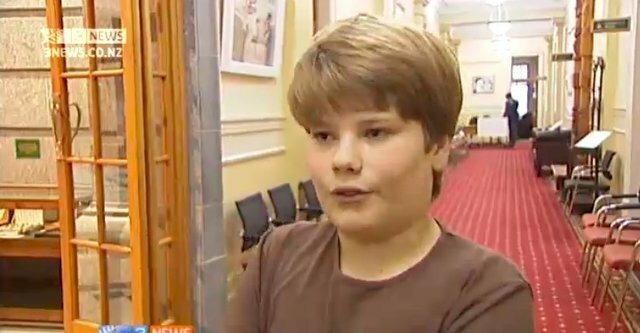 12-year-old To New Zealand Parliament: "Stop Whaling"
A 12-year-old boy appeared before the New Zealand Parliament this week, demanding that the government take more action to stop Japanese whaling ships that are en route to the Southern Ocean. Isaac Scott, who also handed over a petition he had started two years ago that now has over 5,000 signatures, was invited by a member of Parliament to give a speech before the Foreign Affairs, Defence and Trade Select Committee, 3 News of New Zealand reports. "I am here to ask you to set an example to the rest of the world and stop whaling in the Southern Ocean," said Scott, who hopes that New Zealand, which banned whaling 50 years ago, will send naval ships down to deter the Japanese ships, who are legally taking whales on the basis of "scientific research" -- a loophole in the International Whaling Commission. "Since I've been growing older my passion for them has just been growing bigger and bigger and bigger because of their size, their intelligence," Scott added.The boy's speech, which can be seen on video here, reminds of another passionate environmental speech from a child -- at the UN Earth Summit in 1992, a 12-year-old girl named Severn Suzuki gave a speech on the need for better environmental awareness. Now known as "The Girl Who Silenced the World for 5 Minutes," the speech quickly became international news, and is a viral hit today. "I am here to ask you to set an example to the rest of the world and stop whaling in the Southern Ocean," said Scott, who hopes that New Zealand, which banned whaling 50 years ago, will send naval ships down to deter the Japanese ships, who are legally taking whales on the basis of "scientific research" -- a loophole in the International Whaling Commission. "Since I've been growing older my passion for them has just been growing bigger and bigger and bigger because of their size, their intelligence," Scott added. The boy's speech, which can be seen on video here, reminds of another passionate environmental speech from a child -- at the UN Earth Summit in 1992, a 12-year-old girl named Severn Suzuki gave a speech on the need for better environmental awareness. Now known as "The Girl Who Silenced the World for 5 Minutes," the speech quickly became international news, and is a viral hit today.